DETROIT – Ken Holland often talks about success requiring hard work and how it never comes easy. Unrestricted fre agent Marian Hossa seemingly bought into that philosophy on Wednesday when he signed a one-year contract, thus securing the Red Wings’ chances of repeating as Stanley Cup champions next spring. Hossa, 29, helped the Pittsburgh Penguins reach the 2008 Stanley Cup finals, where they eventually lost to the Red Wings in six games. He had three goals and four assists in the Cup finals. It’s believed that the Edmonton Oilers were also suitors in the Hossa sweepstakes, with a reported offer of as much as $9 million for the Czechoslovakian star. He indicated that he did not have discussions with the Pens about a one-year deal. Still the decision to turndown a bigger pay day elsewhere was difficult, Hossa said, but after 10 seasons in the league, his priorities have changed. “I wanted the best chance to win the Stanley Cup and I feel like Detroit is the team,” Hossa said during a teleconference Wednesday afternoon. “I know I could get more money somewhere else, but the thing that I was looking for for myself was to win the Stanley Cup. It’s extremely difficult, especially in the new cap world, to win back-to-back Stanley Cups. The last team to do so was Detroit in 1997 and ’98. But Holland believes Hossa’s desire and hunger to win can be a driving force, similar to what the team witnessed with veteran forward Dallas Drake. “I really think that Dallas Drake was a major factor in us winning the Stanley Cup,” Holland said. “Obviously, with his play on the ice, but for Dallas, he made a lot of sacrifices to want to come here to give himself an opportunity. When we got close, I thought a lot of our players played for Dallas. Over the years, Holland has built a pretty solid relationship with Hossa’s agent Ritch Winter, of Edmonton, who also represents Dominik Hasek. But Holland was still shocked by the call he got Wednesday morning. “I was at the Mobil station to get gas when the phone rang and it was Rich,” Holland said. “I was caught way off guard. Shocked obviously was my initial reaction. Hossa’s signing should squelch the past scrutinizing in the media that the Wings received during the regular-season for a lack of secondary scoring. That issue was basically put to rest with the Stanley Cup last month, but making a big splash in the free agency pool for a top-notch power forward is huge. Often during the regular-season, the Wings were criticized for relying too much on their top line of Pavel Datsyuk, Henrik Zetterberg and Tomas Holmstrom to score. Landing Hossa, who has scored 299 goals and 349 assists with a plus-85 rating in 701 career games, should silence that issue. 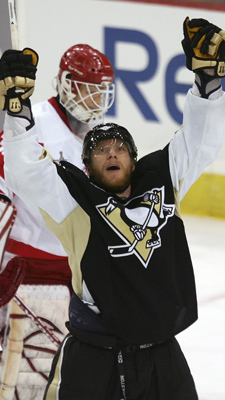 The Penguins acquired Hossa and Pascal Dupuis at the February trade deadline from Atlanta for three young stars -- Colby Armstrong, Erik Christensen and Angelo Esposito, and a 2008 first-round pick (Daultan Leveille, 29th overall). Dupuis signed a three-year contract worth more than $4 million to stay in Pittsburgh. In the Pens’ march to the Cup finals, Hossa put to rest the notion that he’s a better regular-season performer, whose productivity falls off once the playoffs roll around. He led the Pens in scoring with 12 goals, and was second to Sidney Crosby in assists with 14. In Atlanta’s 5-1 win over the Red Wings on Jan. 15, Hossa wrecked havoc, recording his seventh career hat trick before the game was half old. A first-round draft pick by the Ottawa Senators in 1997, Hossa said he’s harbored the opportunity to play for the Red Wings for some time. Besides seeing the organization from afar as an opponent, Hossa received some insight from his friend, Red Wings forward Tomas Kopecky. Hossa’s deal with the Red Wings continues a free agency exodus from the Penguins, who also lost forwards Gary Roberts, Ryan Malone, Adam Hall, and back-up goalie Ty Conklin, who on Tuesday also signed a one-year deal with the Red Wings. 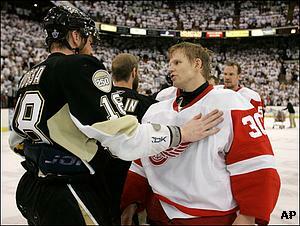 Secure the best seats NOW to see the Stanley Cup champion Red Wings in action during the 2008-09 season! Call 313-396-7575 or click here to place your season ticket order today!